Weapons companies are due to descend on London in September for the world’s largest arms fair. This ‘fair’, a pleasant sounding term for what really is a market for mass destruction, will generate millions of pounds in profit for the arms industry. The arms trade of course, by definition, profits from global instability and war. The main sponsors this year are General Dynamics and BAE Systems, with Lockheed Martin, Babcock International and Rolls-Royce also exhibiting. These particular companies all profit from the nuclear weapons systems of the United Kingdom or the United States. It is therefore in the interest of these companies for Britain to ignore its legal commitment to disarm, as the obscene amounts of money spent on an immoral and militarily useless weapon will line their pockets. With the final decision on whether or not to buy a new nuclear weapon system due to be taken by the British Parliament in three years’ time, these companies are now heavily lobbying for the current system, Trident, to be replaced. These companies hold huge influence on government policy. The arms fair itself is supported by the UK government’s Ministry of Defence and its Trade and Investment section. An executive of BAE Systems attended the recent Bilderberg group meeting, a secret gathering of influential politicians and business leaders from Europe and North America. The chairman of the company, Richard Olver, was awarded a knighthood earlier this year. BAE Systems manufacture the Vanguard-class submarines that act as the platform for the UK’s nuclear bombs. Should Trident be replaced, BAE would make the new submarines at its ship-yard in Barrow in Furness, in Cumbria. BAE has succeeded in ensuring that Barrow is economically dependent on this ship yard. The government should take steps to reduce this reliance, through diversification and alternative investments, and so reduce BAE’s influence in the area. The skilled workforce there should not be led to believe that their only option is to support the production of weapons of mass destruction. Arms manufacturer Lockheed Martin forms part of the consortium which runs the UK’s nuclear warhead factory at the Atomic Weapons Establishment (AWE) at Aldermaston and Burghfield in Berkshire. Rolls Royce manufactures the nuclear reactors used to power the submarines at their factory in Derby. Their lobbying efforts to ensure that Britain remains nuclear-armed include giving evidence to the Parliament’s Defence Committee on the future of Trident. The Rolls-Royce representative spoke of the negative effect on skills and knowledge should the contract for new Trident submarines fail to go ahead. BAE spoke of the need for a regular ‘drumbeat’ of submarine production to ensure that the UK skills-base does not erode. BAE Systems, Lockheed Martin and Rolls Royce are also in the process of manufacturing unmanned aerial vehicles, more commonly known as drones. BAE is currently developing the Taranis model, an experimental ‘super drone’ which would carry a variety of weapons and could be controlled from anywhere in the world. A significant concern among anti-drone campaigners is that they could be used in the future to transport nuclear weapons, with all the potentially devastating risks which that would entail. The past record of these arms companies is dubious, to say the least. In 2012, BAE was forced to pay millions of pounds worth of fines in Tanzania following an investigation by the Serious Fraud Office over an arms deal. The company was again fined this year, for breaking health and safety laws, causing the death of one of its workers. The arms fair is highly controversial. In 2007, it went ahead despite the local council unanimously voting to condemn the event. And for good reason. Countries which have been identified as ‘major countries of concern’ by the Foreign Office are invited by the Ministry of Defence to an event in London to sell and buy arms from companies which make their profit from the darkest actions of humanity. Companies which strive to ensure that the UK should spend over £100 billion on new nuclear weapons should not be exhibiting their wares to more prospective buyers. 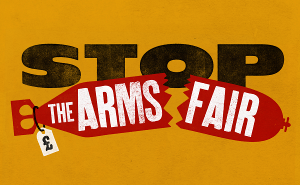 Stop the arms fair now. Pay a visit to your local General Dynamics, BAE Systems, Lockheed Martin, Babcock International or Rolls-Royce site in the week before the arms fair to step up the pressure for an end to the fair. How truly sad that you cannot see how we can survive without nuclear weapons. I wonder how long it will be before nuclear weapons convoy does not have a shunt accident on the A34, this is the most dangerous road in the country, officially and I live in Oxford. If a plutonium plume were to be released I live down wind from the prevailing wind.